Q: Why won’t my single hung vent stay open? Q: What are balancers, what do they look like and where is the product number located? A: Balancers hold the weight of a single hung window vent when the vent is open. They prevent the vent from an unintentional closure. Please see the below picture to view what a balancer looks like and where the product number can be located. If you have more questions about balancers, please view our video library to find more information on balancers. Q: Why is my single hung window hard to open or close? A: Balancers are a block & tackle pulley and spring system. Often construction debris and/ or silt will work its way into the mechanism over time. By removing the balancers and the debris and giving a light spray of silicone spray may resolve the problem. Q: What are weep holes and what are the used for? 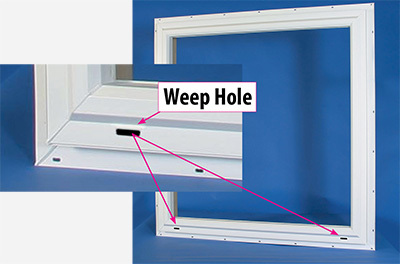 A: Weep holes are small cut-outs at the bottom of the window frame when looking from the outside-in. When the passage within the frame is clear of dust and debris, rain will automatically be lead towards the outside of the frame to make sure no water is entering the house. To clean the weep holes or to open the passage, simply use a small screwdriver and remove any visible debris and dust. If you have any more questions, please view our video library to find a properly cleaning instruction video. Q: Why is the inside of my window damp when I touch the glass? A: Condensation is a common occurrence in modern construction. Houses are built almost air tight now, and with limited ventilation humidity will build up on surfaces with different temperatures just like your bathroom mirror will fog up after a shower or a cold drink will accumulate condensation on a hot day. Q: What is the difference between 5/8” flat grids and 1” sculptured grids? Q: Why is Champion’s window track system better? A. As you can see, Champion Windows tracks are curved on the top rather than being flat. The reason behind this is, that a window cannot simply move out of the track or move in general. 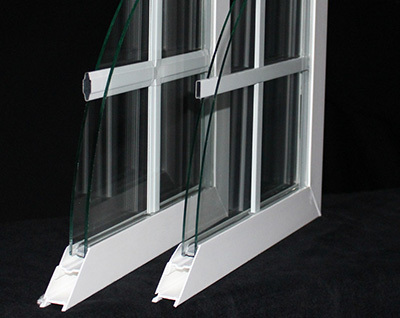 The Champion Windows track provides more stability and security for your windows as well as more ease to operate the Vent. Q: What is a stress crack & can it happen to a vinyl window? A: A stress crack is a broad term used to describe glass breakage on older systems that rely on the glass to provide structure to the window frames and sash. NO Champion Windows products and all vinyl windows using modern windows cannot have stress cracks due to the design. Q: What is the difference between “callout size” and NFD (Net Frame Dimension)? A: Call Out Size describes the size of a window as specified on the plan and elevation using 4 digits, whereby the Net Frame Dimension measures the action frame of the window not including the nailing fin. A: “Callout size” is a term used to describe the size of a window as specified on the plan and elevation using 4 digits. The first digit is the width in feet in whole numbers. The second digit is any remaining inches in the width. The third digit is the height in feet in whole numbers. The forth digit is any remaining inches in the height. Example: A three six five zero (3650) is a callout size that is three feet and six inches wide and five feet tall (42 inches wide by 60 inches tall). Q: What is a rough opening? Q: What does the term “Egress” mean? A: Egress, meaning exit, is a term used to describe an opening required by building code in all bedrooms. Minimum requirements are 20 inches wide and 24 inches high, with a minimum square footage of 5.7 square feet.